A tiny rosemary among giants, Blue Boy Rosemary is a true novelty. Blue Boy is slow growing and is perfect for edging a garden or planting in a container. The tiny leaves add the same piney flavor that any rosemary would. 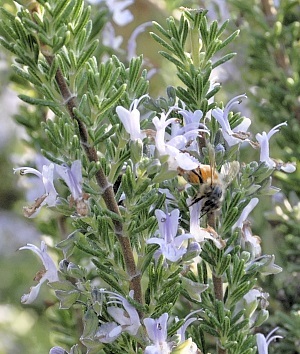 Like all Rosemary, the bees are particularly fond of their flowers. The photo below shows a very old Blue Boy Rosemary that has been allowed to spread by putting stems on the soil and rooting in that spot. This basically creates another part to grow and spread. If space is at a premium, keep Blue Boy trimmed off the ground. This plant is nearing the end of its bloom cycle which starts in late October and continues well into January. The tall gray plant behind it is Garden Sage which is looking a little sad at this point in the season. The front part of this Blue Boy Rosemary, with the vibrant green tips, has started to push out some new growth. 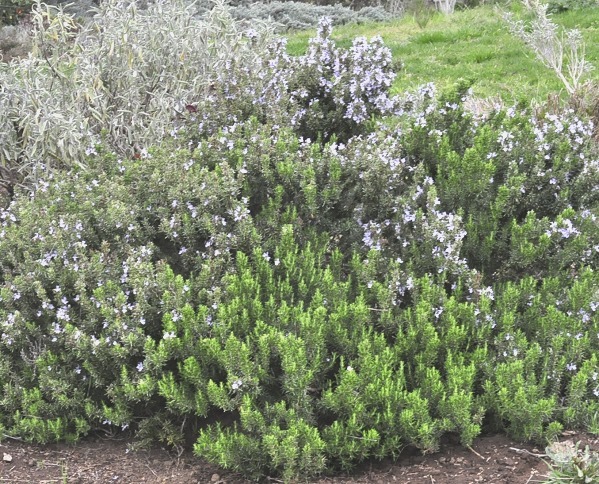 Blue Boy Rosemary is one of the six plants chosen to be in our Small Space Herb Garden Six Pack. This plant is often available in plug trays. These trays hold 128 of all the same plant. They are a great low cost way to fill a lot of space. Each cell is 3/4 of inch by an inch. Check here to see if Blue Boy Rosemary Plug Trays are available.